A warm summer breeze blew from one end of the passageway to the other. Raisa Hewitt could feel it gently caress her face and flow like fingers through her long, dark hair. She could hear the friendly chattering of birds from outside the arch ahead of her, the rustle of leaves in tree branches, she inhaled sweet almond and jacaranda blossoms. The scene was supremely idyllic and she realized she couldn’t be in more danger. She’d dressed casually like a tourist, an American on holiday taking in the ruins of Spanish castles and churches. Soft canvas shoes made not a whisper as she padded like a cat across the flat stones beneath her. Jeans over a black leotard and a light cotton shirt afforded comfort and mobility. The Springfield XDM Compact in the holster at the base of her spine offered both maximum portability and stopping power. She hoped she wouldn’t have to use it. Raisa had slipped away from the rest of the tour. Technically, this structure was off limits for repairs, but it was a Sunday and there were neither workers nor security to stop her. She’d walked halfway from the entrance behind her to the exit in front. The darkened arches on either side of her could conceal a dozen enemies, and windows from above afforded snipers an excellent vantage from which to kill. If she drew her weapon now, she might save her own life, but then she couldn’t claim to be a lost tourist if seen by an antiquities employee. She’d have to bank on him not ordering her dead before they spoke. Birds casually fluttered above her unalarmed which was a good sign. No sounds of hammers being pulled back, no breathing other than her own, no rustle of clothing, her every sense told her she was alone. She continued her steady, cautious pace. Sunlight struck her forearm and then momentarily blinded her and she cursed her foolishness. That would have been the perfect time for him have them strike or to fire the kill shot himself. But the moment passed and there was nothing except the ruins, the natural world, and her. She neared the arch. On the other side was a low balcony and if she climbed over, a serene pastoral expanse graced by late morning sunlight. He had said to meet him by the tree, but after ten long years, she learned not only that he couldn’t be trusted, but that he was superbly lethal, a combination that raised the tiny hairs on the back of her neck. She ducked down beneath the low wall after she passed through the arch, unwilling to allow herself to be in the light and open, exposed to terminal threats from any direction. She listened. The breeze, tree branches creaking, bird calls, were those voices? He couldn’t be trusted but he didn’t always lie either. Besides, he had something she wanted and that was the only reason she agreed to come here in the first place. He wouldn’t kill her in cold blood right in front of their son, would he? “Silas?” She was trembling as she called his name from behind the wall. She had to risk it. It was her only hope of seeing him again, but she could still be dead in the next few seconds. Raisa stood up. Beneath the tree was her nine-year-old little boy and his father. Ahmed looked almost the same as the last time they’d met. They had tried to kill each other that day and for the sake of Silas, they both chose to fail, though she still had the scars of two bullet wounds on her right side close to the bikini line to commemorate the event. She hoped he was still occasionally bothered by the reminder of the .45 slug she’d put in his thigh. Raisa vaulted over the wall and landed on her feet in the dirt. She quickly assessed her situation. No sign of anyone else except the three of them. He wouldn’t have her murdered right in front of their son. She had to believe that. Then she started walking toward them. “Mommy!” Silas ran forward toward her. She looked closely at Ahmed’s face. He didn’t seem alarmed at losing physical control of their boy. Now they were both in the open. What was his game? “Mommy!” Silas leapt into her arms. It felt so good to hold him again but embracing him meant she would be slow in reaching her handgun if she needed it suddenly. So that’s where they’ve been living. Hand-in-hand, mother and child approached the man dressed in a casual summer suit. Ahmed always looked like he should be on the deck of a yacht, scanning the distant shores of the Mediterranean while sipping on a dry martini. One of her weaknesses was being attracted to wealthy, charismatic men. “Let’s talk first, then we’ll see.” She was immediately safe so she relaxed just slightly, but after they parted, he could easily have her killed. “Mommy, try to be nice.” Silas was still holding her hand and now he was squeezing it. “I took him and disappeared because your bloody CIA wanted to lock me in one of your private dungeons and throw away the key.” They both knew that certain high profile international targets, when captured, bypassed the usual court and prison systems and were permanently incarcerated in phantom institutions never to be heard from again. Raisa reached out with her senses looking and listening for any sign. Ahmed was good, he was very good, which was why he was wanted by seven national governments and Interpol but then, she was an independent for hire as well. If this were a trap, it was better than any she had been in or set up. As far as she could tell, they were the only three people within a half-kilometer in any direction. “Daddy explained it to me, but I haven’t seen you in almost four years. I miss you so much.” Now he was crying and the mother hiding inside of the assassin wanted to cry too. He let go of the boy and stood. “For what it’s worth Raisa, I’m sorry for everything that’s come between us.” He extended his hand. She took it but instead of shaking, they just held on to each other for a long few seconds and then let go. Raisa took a few steps back and let Silas and Ahmed say tearful farewells. Then she held her son’s hand and they walked back toward the ruins, went over the wall, and then through the arch. At the other end of the passageway, they would step again into the sunlight and begin a new life together. 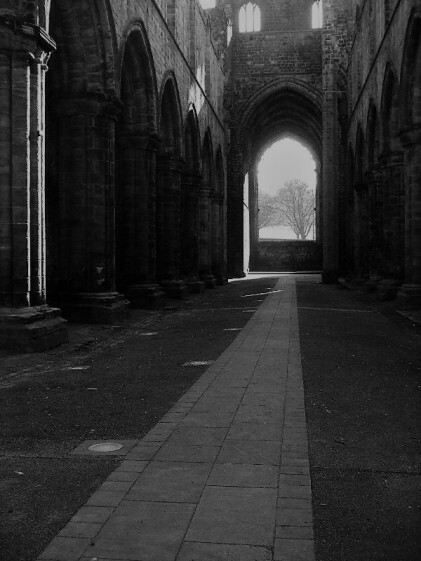 I wrote this for the Thursday photo prompt – Arch #writephoto hosted at Sue Vincent’s Daily Echo. Every week, Sue posts one of her photographs as a prompt for participating authors to craft a poem, short story, or other creative work. I suppose this being International Women’s Day, I wanted to write a tale specifically about a woman protagonist. Although Sue’s photo looks very peaceful and pleasant, something inside of me said “trap,” so I had Raisa enter cautiously. I only had a vague idea of what the story should be about so I let it unfold as I tapped on the keyboard. I got some of my inspiration from the 2005 film Mr and Mrs Smith starring Brad Pitt and Angelina Jolie, but decided to intensify the conflict between them and also to give them a child. Neither Raisa nor Ahmed are terribly trusting or trustworthy, but that goes with their careers. However, at some point that has to give way for the sake of their son Silas. He’s the child of two international assassins, although I’ve created the sense that Ahmed has crossed the line more times than she has, thus his being a wanted man. In the end, the needs of their child won out and who’s to say what will develop in the future. Whatever the future holds for them all, it is nice to read that the child is not being used as a bargaining chip. Thanks, Sue. Still, it would be quite different having the two of them as parents. I can barely imagine. Yet hired hands must be human too. Well, high priced assassins for hire and yes, I tried to depict them as human, although obviously with a heightened expectation of danger. There must be a disconnect from their humanity though, in that line of work. It’s called compartmentalization. You feel and care in your personal life, but a target is just business. The exception was when husband and wife tried to kill each other. He had to deliberately miss although by rights, if they’d really been trying, one of them would have ended up dead. Compartmentalisation, like any tool, can be a useful or a damnably dangerous thing. It becomes very easy to dissociate oneself from all connection or consequence. Of course they live damnably dangerous lives. They do, yes, but I know a good many who don’t and still fall foul of that particular trait. That’s not so much a consequence of a career choice as human nature. Frankly, trying to kill each other aside, Raina and Ahmed seem to be handling the current situation better than most. Of course it would be sort of like having Batman and Catwoman for parents. There are enough family problems without that! That’s a complicated family situation. One wonders what will become of the child when they grow up – probably follow in the family footsteps to become a spy. Hard to say. My guess is they’ll try to discourage that career choice. Their skill sets are reserved for professional hits. They are actually pretty good parents. neatly done; the echoes of the Pitt-Jolie film are there but with a more believable tension than in the film (where their violence to each other seemed a bit to fifty shades). Much enjoyed this. Thanks. I appreciate the complement of being able to write better than Hollywood filmmakers. This story was tense! Well written. I kept waiting for some sort of dramatic action! Which is why I prevented them from killing each other. It’s possible to have dynamic tension and then to resolve the situation. Thanks. James… WELL done. I was engrossed, my heart cried for the little boy who missed his Mom And the young man who will miss his Dad. His parents have a very troubled relationship, and very difficult careers. Thank you.